Group Time for preschoolers often happens several times a day, you need fresh activities to interact with the children and keep them engaged. 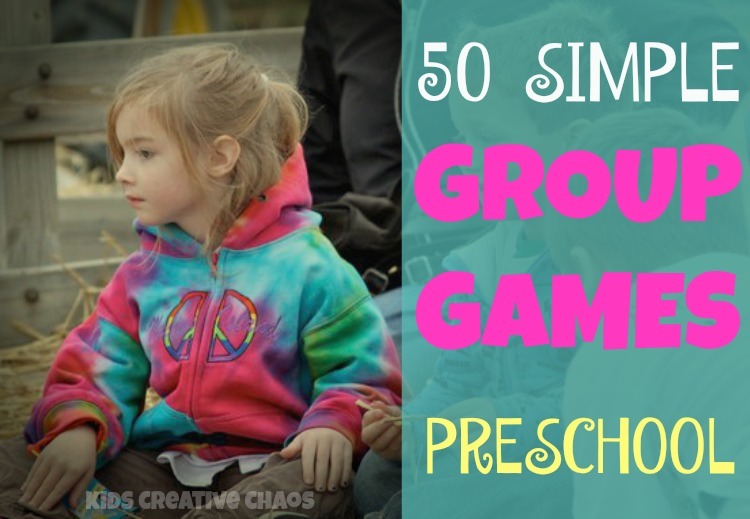 These 50 simple group time games for preschoolers are perfect for three, four, and five year olds and they can be adapted for use with kindergarten or early elementary. Enjoy! 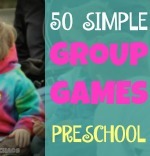 50 Simple Group Time Games for Preschooler at Circle Time. Childcare Quarterly states that, "research and anecdotal evidence indicate the need for social interaction and emotional regulation in children. Just as in the other developmental domains, social and emotional development are built on meaningful, supportive, and authentic experiences with adults and with other children. Circle times, then, have as their main goal social interaction among the children and between the children and the group leader." During group time give the kids a magic word. If you remember Pee Wee Herman, this is similar to the secret Word of the Day. Everyone who is paying attention will be in on the secret. Throughout the day, use this magic word for lining up or transitioning to activities. Those who know the word will get to do the activity first or be first in line. Eventually, all of the children will catch on to the magic word of the day. Blindfold one child and place her in the middle of the group's circle. Have the other children pass a noisy item (such as keys) around the circle. Think, Marco Polo without all of the shouting! When the blindfolded child recognizes the sound, she shouts for the rest of the group to stop and then points toward the item. If she is incorrect the game continues until she guesses correctly. Cut out different shapes from craft foam. Place the foam on the floor and ask the kids to "cross the river" by walking only on triangles. Choose different shapes each time. This is a great way to teach preschoolers to identify shapes. Draw a shape on a piece of paper: circle, square, triangle, oval, rectangle, etc. Place the shape on cardboard and trace it. Take a hole punch and punch holes around the shape. Tie the yarn into the first hole and let the kids lace the shapes. While they are working, go around the circle and ask each child to share their shape. What shape is it? What else could it be? For example, a triangle could be a dog house. This keeps them busy while waiting their turn. Like these ideas? Get our book with printable pages that are the perfect size for your clipboard! Best Circle Time Group Games. Introduce yourself and the person sitting next to you. Continue around the circle. Then, do a silly version. Introduce yourself with a silly name and give the person next to you a silly name too. Tell the kids that you are going to mix up the fruit. Have the children draw a name of a fruit out of a basket. They don't have to keep it a secret. When the leader calls out the fruit the children with that fruit move to a new spot or do as the leader says. Mix it up! Sit kids on the floor in a circle. Pick one child to be the kitty and to wear the cat ears. The kitty crawls up to another kid and meows. The other child pets the kitty on the head while saying "poor kitty" without smiling. If he laughs or smiles, he becomes the kitty. Ask the children what month they have their birthday. Then, call out a month. Kids whose birthdays are in that month run around the circle and back to their original spot in the circle. Grab an old Go Fish or Old Maid deck of cards, give each child a card. Now, have the kids find the other people with the matching cards. First time, they can talk. Second time, no talking allowed. This is a great way to divide up into teams or partners. Simply clap. One clap continues the direction and two claps reverses direction. Teaches the importance of paying attention. Remove one player from the room. Give the bone to a player in the circle. This child places the paper bone behind her back. The other player returns to the room and tries to guess who has the bone. Can they sniff it? Can they guess by facial expressions? 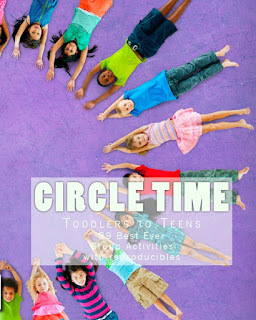 Find how to play this game and over 30 other group circle games in our Circle Time Handbook. Get a giant jigsaw puzzle or make your own with foam. Then, give all players a piece of the jigsaw puzzle. Each player has to find the other players with the matches to their puzzle piece. Remove one child from the room. While he is out, the group nominates someone else to speak. When the child reenters the room they stand in the middle of the circle. The nominated child disguises their voice and says ‘99.' The first child guesses who is speaking. Start with a familiar word. Then, the group claps twice. The next player must say a related word. For example, "dog" clap, clap, "bone," clap, clap, "skeleton." Passes from player to player all around the circle. Choose a name out of a hat to start. Clap around the circle stopping to clap the syllables of each child's name. For example, two claps for Jacob, three claps for Samantha. Break into groups of three to five. Standing in rows, see how quickly each row can arrange themselves by height. Can they beat the other rows? Change it up with ages, birthday months, or alphabetical by names. Fill a bag with plastic animals. Each player pulls an animal from the bag and places the animal on her head. Then, go around the circle and sing the song with each player's name. And she’ll keep it there all day! Think Four Corners. Place a sign with North, South, East and West on four walls. Players start in the middle and someone shouts where to sail the ship. If the leader shouts, "All round the world," the players have to visit all four walls and get back to the middle as quickly as possible. One player pretends to be Frankenstein. He walks towards the others in a slow, creepy, Frankenstein way with arms out. The player he is walking toward calls out another name. Frankenstein walks toward the next person named. Shout a new name before Frankenstein touches you. This is a great ice breaker to learn each other's names. Change Frankenstein after five names. Leader calls out a number. The players break into small groups and link arms with that number of people. Once everyone is linked they cross to the other side of the circle. If anyone is odd man out, they get to call out the next number. Seat players in the circle. Pass a cookie behind their backs while they chant, "Who stole the cookie from the cookie jar?" Teddy stole the cookie form the cookie jar. Player whose name was called says, "Who me?" Everyone else says, "Yes, you!" Player whose name was called says, "Couldn't be." Everyone else says, "Then who?" Player whose name was called chooses the next name. 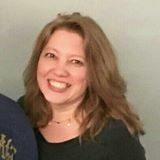 "Terri stole the cookie from the cookie jar." Repeat until all names are called. The leader mimes an action. Everyone else must copy the action. The next person mimes that action and adds one of their own and so on. Get or make cards with matches. Each player takes a card without speaking. They must find the other person with the matching picture card. Use regular cards and match numbers or use picture cards and match things like a baseball and bat. Name game with finger play. Say the words while pointing to each finger. Start with the pinkie finger. Then move to the index finger. Each time you move, point to the next finger and say, “Johnny Whoops.” Work your way back saying the name of each finger and then "Johnny Whoops!" Think Bugs in a Rug! Move around the room to the music, when the music stops have the players curl up like hedgehogs. Put a blanket over one player and then the others stand up and guess who is under the blanket. Think Musical Chairs! Place sheets of newspaper or butcher paper on the floor. When the music stops everyone must be standing on the paper. One by one, take the pieces of paper away until there is only one left. Beforehand, have the children decorate the paper like islands. Take turns calling out someone’s name. When your name is called, you must swap seats. This is a good game to play during transition time. First kid states their name and points to another kid, who stands up and repeats the first kid's name. This continues until every kid states everyone else's name. Think Telephone! Everyone stands in a line in a circle with eyes closed. The first player taps the person standing in front of them. When they turn around, they mime an action. Pass the mime around the circle. Can it make it to the end? Make up actions for the buttons on a remote control, when that button is pressed they perform the action. Make your own pretend remote or get a giant remote control. Players stand in a circle and wait to hear how they must connect with each other. Connect fingers, elbows, ankles, etc. If safe, ask them to move left or right while connected. As you go around the circle, everyone chooses a positive adjective to describe their personality. Go around the circle and ask, "What color would you be?" Everyone must answer something like this, "If I were a color, I would be blue, because it is the color of the sky." Everyone closes their eyes and listens for two minutes. Then, the leader goes around the circle asking what sounds were heard. Go around the circle asking what instrument each child would be if they were an instrument. Now, they must also make the sound and pretend to be that instrument. At the end, have a marching band concert with all of the "instruments." Prep with several different colored items. Ask the children, "What color is this?" Let them shout out answers. Next, go around the circle and ask each child to name something else in the room that is the same color. Wiggle fingers to make rain. Pass around the circle until everyone is wiggling their fingers. Change the action: Wave arms to make wind, stomp feet to make thunder, raise arms in a circle to make the sun. Stand the children in two lines facing each other. The person across from them is their mirror. Take turns being the mirror and being the one looking into the mirror. Make cards for each child. Make a few with each number from one to five, then one of each number from six to eight. Without talking, players must find the other numbers in their group. When they find a number match, they pretend to be happy to see them and continue walking together with their number group until all members of their number group are found. If someone with a different number tries to join, they do not let them join their group. Then, talk about how it feels to be left out and how it feels to belong to a group. Hand a basket of items to the kids to hold or wear. (Bunny ears, gloves, scarves, pillows) Tell everyone to study each other. Then, remove one player from the room. When they return, they must guess what is different. You can also have kids change places with each other. Everyone sits in a circle. Slowly say, "chug a chug a chug a." Then, begin to chant faster, "chugga chugga chugga chugga." While chanting, slowly stand up. When everyone is standing straight and tall, have them move their arms back and forth and begin to move around the circle together as a train while continuing chanting. Take turns saying, "choo-choo!" One person in the middle of the circle calls out, "Help, help!" Others reply, "What’s the matter?" The first person makes up a situation. For example, I'm stuck up a ladder or a dog chased me up a tree. The others reply, "Who do you want to help?" The person in the middle makes up random traits for who he wants to help. For example, anyone in a red shirt, someone with tennis shoes... The others nominate a person to help based on these traits. Then the nominee swaps places with the person in the middle. Everyone sits in a circle. One person says, "Peek-a-boo, I see you." Then, they call out a person(s) by attire. For example, "Peek-a-boo, I see you in a red shirt." Everyone in a red shirt stands up. Now, the person speaking covers his eyes. The others wearing red shirts sit back down in different places. Now, the person speaking uncovers his eyes and points to the first person he sees in a red shirt. This person is now "it" and starts the game again with a new item of clothing. "I see you in the tennis shoes." Make cards in advance depicting feelings or actions. Player draws a card and acts out the action. Everyone else must guess the action or emotion. Play music, children move around the circle. When the music stops, they must greet each other with a greeting. Hello, How do you do, Good Morning... Next, they ask each other one question. For example, "What is your favorite color?" This is a fun icebreaker game. Everyone sits in the circle. Grab a blanket or a big beach towel. Now, pick two children to leave the room or wear a fun blindfold. Shh! Just point at the children, grab their hands and take them away from the group. Next, point at two more children and then to the "rug." Hide the children under the "rug." Bring the others back. Can they guess who is missing? One child crosses the circle to shake hands and ask a question and then returns to their previous position. Now, the questioned child crosses the circle and does the same thing choosing a different child. Play continues until everyone has a turn. While children are in line or at their desks, the leader says, "Come sit in the circle if you live in an apartment." "Come sit in the circle if you drive a van." "Come sit in the circle if you have a dog." "Come sit in the circle if you go to school." When everyone is seated, the leader talks about what it means to have things in common. What it means to have a community. "We are a community of preschoolers with dogs and cats." Think Duck, Duck, Goose. Everyone sits in the circle. Choose one butterfly. This child flaps fingers like a butterfly as they walk around the circle. Chant, "One little butterfly flew away on a very bright, warm summer day. It flew up in the sky so blue, And when it landed, it landed on you!" The butterfly taps another child on the shoulder. Now this person is the butterfly.